A mobile phone in a mechanical watch? Many manufacturers have looked at the humble mobile phone and looked at ways to improve it. But not many have decided that more mechanical parts are needed, as in the case of the Mobiado Professional 105GMT Gold. 'Why the GMT?' you might ask. Well, that's because Mobiado has stuffed two mechanical watches at the bottom of the handset, in a 'why on earth would you need that?' style move. The phone itself, which does not have a price yet, is a top-end, luxury model. 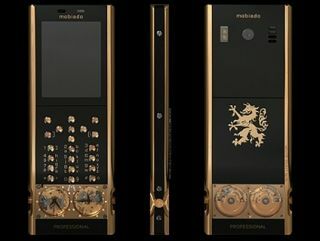 The chassis is made of sapphire crystal and ebony wood, and is painted in 24-carat gold, as is the keypad, which is also made from sapphire crystal. The all-important watch itself has 25 jewelled bearings and is painted in, yes, you've guessed it, 24-carat gold. The phone itself packs some decent features: 1GB of memory, 3.5G, 2MP camera, S40 interface. Well, decent features if you're paying £50 for the handset. Why these luxury (and likely to be well over £1,000) handsets can't make phones with the best ever features in, we'll never know.